We will give glory to Him, because He hath shown His mercy to us. V. O Lord our Lord, how wonderful is Thy Name in all the earth! R. O the depth of the riches of the wisdom and of the knowledge of God! Adorable Unity, graciously hear us. God the Holy Ghost, etc. Spare us, O Holy Trinity. Graciously hear us, O Holy Trinity. 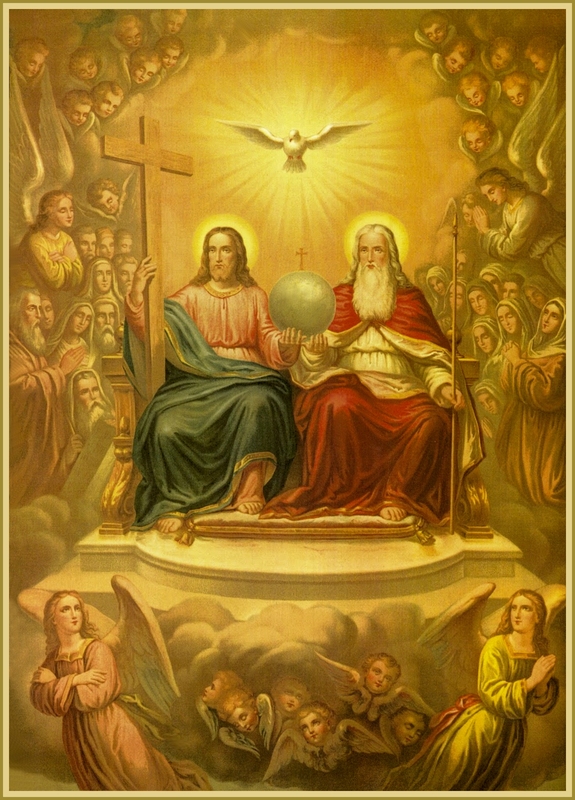 Deliver us, O Holy Trinity. We beseech Thee, hear us. That we may love Thee with all our heart, with all our soul, and with all our strength, etc. We beseech Thee, deliver us. We beseech Thee, save us. Our Father [silently]. Hail Mary [silently]. R. And worthy to be praised, and glorious, and highly exalted forever. Almighty and everlasting God, Who hast granted Thy servants in the confession of the True Faith, to acknowledge the glory of an Eternal Trinity, and in the power of Thy majesty to adore a Unity: we beseech Thee that by the strength of this faith we may be defended from all adversity. Through Jesus Christ Our Lord. R. Amen.